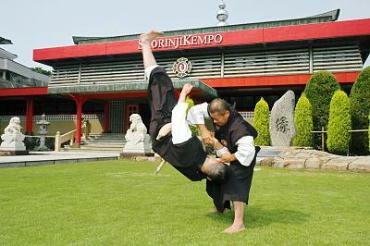 Shorinji Kempo is one of Japanese modern Martial Arts, which is based on Zen Buddhism. practice of Shorinji Kempo techniques and Zen. importance of developing good personality and the making the world better through practicing Shorinji Kempo. Ken refers to the fleshly body. Zen means mind and spirit. Our human bodies and minds are closely intertwined. only to defend oneself against violence. of people without killing or injuring anyone. reinforce each other to become even more effective. as well as improvement in character. For children, Shorinji Kempo helps growing up their body and mind. For teenager/youth, Shorinji Kempo develops their body strength and nurtures spirit greatly. 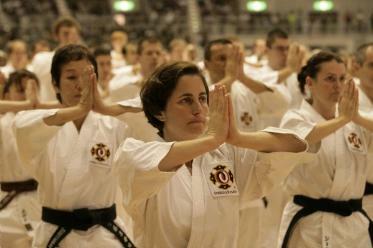 For adults, Shorinji Kempo fosters their health and energy well. For women, Shorinji Kempo enhances their healthy diet excellently. For seniors, Shorinji Kempo maintains their good health and cultivates their energy well. examination. There are White, Yellow (only children), Green, Brown, and Black Belt. countries with its Shorinji Kempo rank. branches and the Masters all over the world have strong relationship each other.